We had a user that could not print from the Crystal Reports Print ActiveX add-on for Internet Explorer on the terminal server. It worked fine for other users on the term server, myself included, and behaved differently for this user when logged onto a different terminal server. 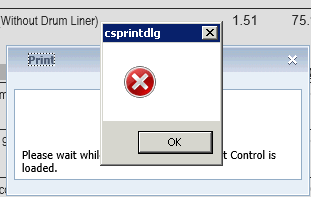 The error message was simply the the Windows red X dialog, with the text "csprintdllg.dll" in the title and nothing in the body of the dialog except an OK button. 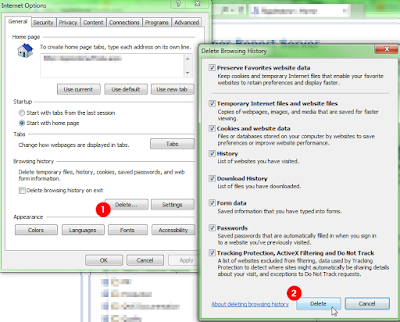 Open Internet Explorer and clear the cache/history completely, then restart it. Note: should NOT have checked the top checkbox there, about Preserving Favories website data. Try using Crystal Reports Print ActiveX control again.